At first, Jeremy Clay wanted to be a soldier. A war hero. The kind of steel-jawed Tommy from the comic books, who single-handedly storms a machine gun post to anguished cries of aieeeeeeeee from the enemy. But after losing a primary school fight to a younger kid who grew up to be a poet, he quietly changed tack. In his early 20s he set out on a short but satisfying career as a layabout, which segued neatly into a stint in an also-ran indie band. No, you haven't heard of them. They released two albums - the second selling even worse than the first - before splitting up, to general indifference. Jeremy has been a journalist since the mid-1990s. As a reporter on a local newspaper, he interviewed people with gripes about bins or buses and encouraged them to say they were either livid or devastated, sometimes both. He also covered global news stories. He reported on the handover of Hong Kong, for instance, albeit from a suburban front garden in the Midlands, where a Union flag was being solemnly lowered by a man who had once lived in the Far East. 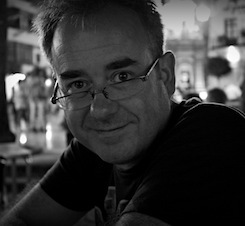 Jeremy has been a features writer and a TV critic and is the author of two books: Leicester Til We Die, the story of the emotionally-charged final season at Filbert Street, and Blokes and Balls (New Holland). He is a dad-of-two, a dog-owner, a drummer and a devotee of alliteration, which he wishes began with a d. He lives in Leicester but doesn't know Kasabian or Sue Townsend, although he did once shake hands with the singer from Showaddywaddy. 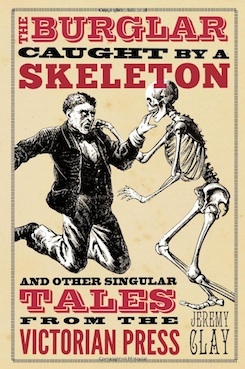 The Burglar Caught by a Skeleton & Other Singular Tales from the Victorian Press by Jeremy Clay has been selected as a ‘Must Read’ by the Daily Mail. Jeremy Clay has written another fascinating piece for the BBC, based on his book The Burglar Caught by a Skeleton. Once again, the article quickly became one of the top 5 Most Read and Most Shared stories on the BBC site. Jeremy Clay’s fascinating new book The Burglar Caught by a Skeleton has received a terrific review in The Times. Jeremy Clay’s fascinating collection of Victorian newspaper stories, The Burglar Caught By A Skeleton, is serialised in today’s Sun. The Burglar Caught By A Skeleton and Other Singular Stories from the Victorian Press.